The upper arms, which include the biceps and triceps, are quite small compared to most other muscle groups. …I say, if you want bigger arms, then you should build bigger arms, dammit! Who cares if it’s a purely aesthetic-driven endeavor? Vanity can be a good thing. So, the purpose of this post is to provide some practical arm training tips and advice for adding size to your biceps and triceps. Note: This post assumes you’re already following a quality bodybuilding diet and weight lifting routine. If not, then you should start there. For general information on working the biceps and triceps, I recommend reading my posts on biceps training and triceps training. To see some good exercises for these muscle groups, refer to my posts on the best biceps exercises and the best triceps exercises. Don’t Ignore the Triceps. The biceps is only one part the upper arm. Actually, it’s the smallest part of the arm; the triceps make up about 2/3 of the arm’s mass, while the biceps make up just 1/3. So don’t ignore the importance of exercises that stimulate the triceps. Focus on Compound Exercises. You can do barbell curls and triceps extensions until the cows come home. But the only result will be disappointment from lack of progress if you don’t already have a base foundation of strength and size. Without a base of strength, you will stagnate quickly on direct arm exercises; and as we know from the principle of progressive overload, the only way to build muscle is to increase your lifts over time. Do Less Direct Arm Exercises. In some cases, especially with beginners, the “less is more” approach may be called for when trying to build bigger arms. Too much direct arm work can interfere with compound lifts that utilize the same muscles. The result is poor biceps and triceps development as well as inhibited strength gains on said compound exercises. Do More Direct Arm Exercises. This piece of advice is targeted to the more experienced lifters who want to build bigger arms. There comes a point where increases in arm size are hard to come by if you only hit indirectly with compound movements. So if you currently perform little to no direct exercises for your biceps and triceps, then now may be the time to make a change. Add isolation exercises to your current weight lifting routine, or change your routine to include an entire workout dedicated to arm training. Do More. One potential way to build bigger biceps is to increase the amount of work you perform using compound pull exercises (e.g. pull ups, barbell bent over row). This helps in the case that you are not sufficiently overloading the biceps and the other muscles involved in pull movements. And so, you’ll stand to gain from increasing your workload. Do Less. The second way to build bigger biceps is to decrease the amount of work you do with compound pull exercises. This helps in the case that you are already performing too much work. Too much work interferes with biceps growth; and it inhibits any results you would experience if you were performing direct biceps work. So by decreasing the workload, you’ll provide the muscles with the rest that they need. Do More. One solution to building bigger triceps entails increasing your total work performed using compound push exercises (e.g. barbell bench press, barbell overhead press). This helps in the case that you are not sufficiently overloading the triceps and the other muscles involved in push movements. And so, you stand to gain from increasing the workload if this is indeed the case. Do Less. 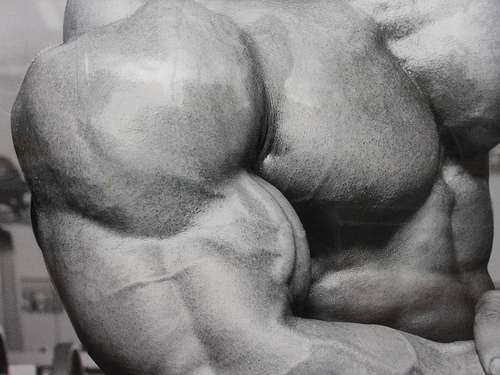 The second method for building bigger triceps is to decrease the amount of work done with compound push exercises. This technique helps if you are already performing too much work. Performing too much work interferes with triceps growth; and it interferes with would-be results if you are also implementing direct triceps work. The benefit of doing fewer compound push exercises is that your muscles receive much needed rest, which translates to muscle growth. Note: You should not implement all of these tips. Just identify the tips that most directly apply to your situation, then integrate them into your routine. Most people don’t see their biceps growing due to the most common mistake, and that being over-training. Biceps are small muscle and do not need to be isolated regularly. Working them 1-2 times a week is enough. Also, focus more on compound exercises which will indirectly help you get bigger arms. Just sign up and you’ll get an email with a full training plan for free.